Instructions: My card size is 6 x 6". Make card base and cover with one of the card fronts. 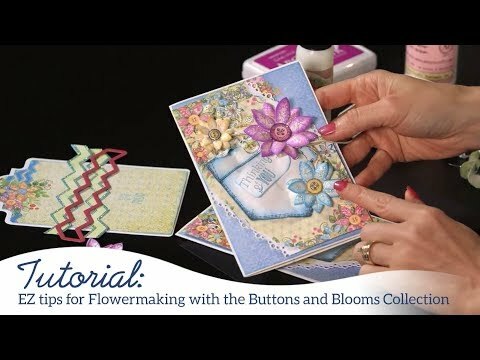 Using various ink colors stamp the flower petals and buttons and cut out using coordinating dies. Using Olive Green ink stamp the leaves and color with Bamboo Leaves ink. Layer the leaves into the mold and run through the Vagabond. Lay aside to dry. Now back to the flower petals. Use the Deluxe Flower Shaping Kit to shape the petals set aside to dry. Cover the buttons with 3D Crystal Lacquer and set aside to dry. Once dry glue to the centers of the flowers. Also glue one of the buttons to the pocket on the card front. Using blue ink stamp the pattern pieces onto pieces of the paper collection. Cut out using the coordinating dies. Using dimensional tape adhere the piece that looks like ric rac to the top of the card. Also use dimensional tape to adhere the three other pattern pieces to the card front. Using the coordinating die cut out a ticket from the paper collection and adhere to the top using dimensional tape. Decide on placement of flowers and leaves along the bottom of the card and using hot glue, glue them down. The card is now ready!